USB CAT5 Active Repeater for Up to 150ft Extend your USB peripherals up to 150ft using regular CAT5/5e/6 RJ45 cable. This repeater cable has built-in buffer & actively regenerates the signals to preserve data integrity. Includes transmitter and receiver modules. 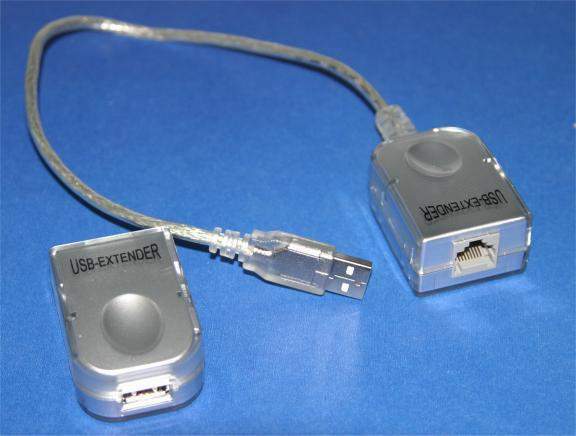 Embedded USB Transceivers at both ends to prevent signal loss. Hubs The maximum number of series Hubs in any USB connection is five (5). This includes any standard USB Hubs in the connection, and the equivalent Hub rating of any Active USB Cable. Supply Current Drawn: 20.0 mA Typical operating current @40C. The repeater does not support the USB 500 uA Maximum Suspend Current limit. If this is a requirement then an external power supply must be used. Interconnect Cable Standard Cat 5/5e/6 Network Cable, 4 twisted wire pairs, #24 AWG wire.